Once again, we are confronted with the question of whether to fully fund Oahu’s rail project. I can't help but draw comparisons with recent world events, like Brexit. Whether one agrees with the outcome of the UK vote to leave the European Union (52% to 48%), a lesson can be learned about making decisions based on passions and populism. Many UK voters are only now considering the gravity of their vote. Some are even asking their government for a “do over,” because their vote was a “protest vote.” They didn’t mean it. We aren't holding a referendum on rail, but the "in or out" question is just the same. Should we fully fund the Oahu’s rail project, from start to finish, all 20-miles, 21-stations (and at some point in the near future, extensions to UH Manoa, West Kapolei, and Waikiki)? This sounds like a simple question; however, like the question before UK voters, it's far more complicated. When considering the ultimate question on rail, one should consider the purpose of the project, why Oahu needs it, and whether it will resolve the issue Oahu is trying to address in the least impactful way. The construction and completion of Honolulu’s rail system as planned will have far reaching economic, social, and environmental impacts and benefits. 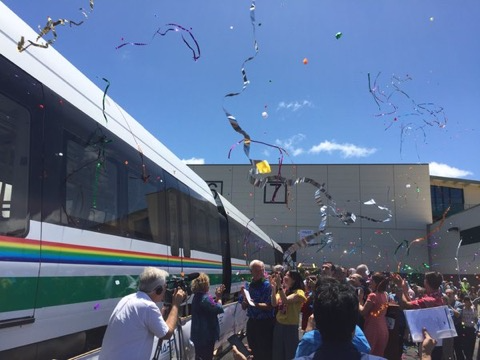 The overarching purpose of the project is to provide high-capacity rapid transit in the highly congested east-west transportation corridor between Kapolei and UH Mānoa. The project is needed to improve mobility for travelers who face increasingly severe traffic congestion, improve transportation system reliability, provide accessibility to new development in support of adopted City land use plans, and improve transportation equity. Rail will serve nearly 70 percent of Oahu's population and more than 80 percent of working taxpayers. With the opportunity to create new communities and rejuvenate existing communities along the alignment, comes endless possibilities to ensure that housing options go vertical and not sprawl out horizontally, preserve the Island’s limited space, implement walkable communities, and reduce the cost of transportation for Hawaii’s families. These are the kinds of communities that surveys show both millennials and our aging population want to live in, work in, and retire in. Project ridership in 2030 is expected to be about 119,600 weekday passenger trips. Rail will eliminate an estimated 40,000 car trips from our congested streets and highways. Each four-car train can carry more than 800 passengers, the equivalent of more than ten buses. Because it operates on its own elevated fixed rail, it will take just 12 minutes to get from the airport to the downtown station. Is the fixed, elevated guideway and technology the best option? The debate continues. All we can do in a civilized democracy is establish a good process. The rail decision process began before 2005 and included elected officials, experts, and the public. Many options were considered and the majority ruled. Subsequent judicial challenges of the environmental review process resulted in an outcome that ensured the avoidance, minimization, or mitigation of significant environmental impacts. After more than a decade of planning, debate, technical reports, litigation, false starts, and finally construction, we find ourselves with a set of trains, several miles of guideway, and a nearly complete operations center. Is it time to stop or only build a part of the project? I hope not. Honolulu's rail project is the democratically arrived at best option to address our quality of life. As we consider what we do next, all factors must be taken into consideration. As we learned from our friends in the UK, there are no do overs.